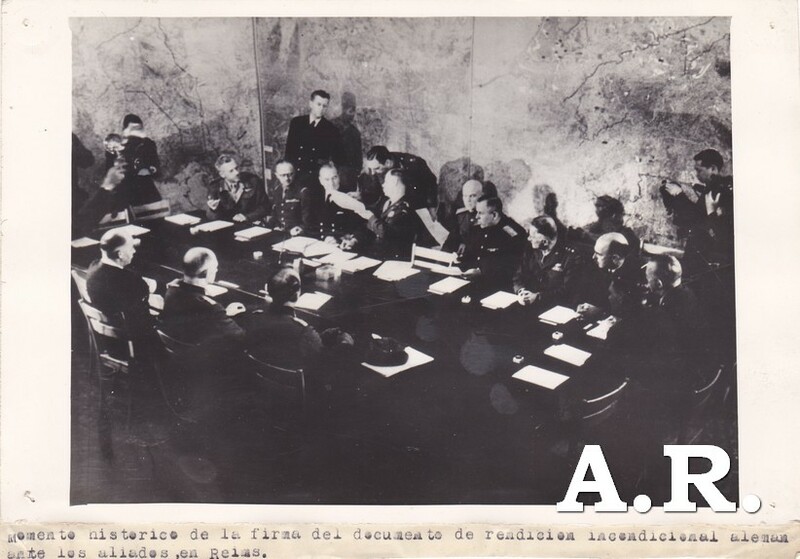 ......................A las 02:41 de la mañana del 7 de mayo de 1945, en los cuarteles de la SHAEF en Reims, Francia, el Jefe del Estado Mayor del Alto Mando de las fuerzas armadas alemanas, el general Alfred Jodl, firmó el acta de rendición incondicional para todas las fuerzas alemanas ante los Aliados. Esta incluía la frase «todas las fuerzas bajo el mando alemán cesarán las operaciones activas a las 23:01 horas, hora de Europa Central, el 8 de mayo de 1945». Tales palabras no hacían diferenciación entre las fuerzas de la Wehrmacht que luchaban contra los aliados occidentales o contra los soviéticos, por lo cual se infería tácitamente que ponía fin a toda resistencia alemana dondequiera que la hubiera. The Second World War was documented on huge scale by thousands of photographers and artists who created millions of pictures. American military photographers representing all of the armed services covered the battlefronts around the world. Every activity of the war was depicted--training, combat, support services, and much more. On the home front, the many federal war agencies produced and collected pictures, posters, and cartoons on such subjects as war production, rationing, and civilian relocation. ...................... At 02:41 am on May 7, 1945, at the SHAEF headquarters in Rheims, France, Chief of Staff of the High Command of the German armed forces, General Alfred Jodl, he signed the act of unconditional surrender of all German forces to the Allies. This included the phrase "all forces under German command cease active operations at 23:01 hours CET, on May 8, 1945". These words made no distinction between the Wehrmacht forces fighting against the Western Allies or the Soviets, so it tacitly inferred that ended all German resistance anywhere any. The United States created in 1935 the agency Black Star. 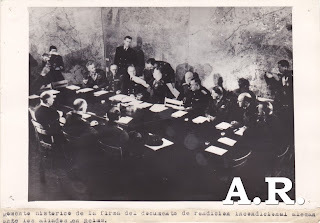 After the war Apis, Dalmas and add Reporters Associés. The founders could produce substantive issues or "big weeklies" that were very successful. The Picture Post devoted to Robert Capa in 1938 at age 25 as the photographer's most important world war. The Rapho Agency in Paris in 1933. They work for her Robert Doisneau, Willy Ronis, Janine Niepce, Serge Sazo, Suzanne Fournier. His photos are used for business, advertising ... Most photographers are humanists. These agencies live largely from reselling your files. The Second World War was documented on huge scale by Thousands of photographers and artists WHO created millions of pictures. American military photographers Representing all of the armed services covered the battlefronts around the world. Every activity of the war was Depicted - training, combat, support services, and much more. On the home front, the war many federal agencies produced and collected pictures, posters, and cartoons on Such subjects as war production, rationing, and civilian relocation.